Linda Wallheim is a committed member of the Mormon community in Draper, Utah, the mother of five grown boys, and the wife of Kurt, a Mormon bishop, an unpaid time-consuming job. "If the Bishop is the father of the ward, the Bishop's wife is the mother, and that meant there were 500 people who were under my care." But she has not got any of the authority of her husband and had had to get used to phone calls in the middle of the night and the way that visitors "looked past because I was never the person that they were there to see." Nevertheless, there are women in the ward who regard her as "the behind-the-scenes leader while your husband is the public one." When we first meet her, she is 54 years old. She is the narrator throughout. Like the author, she had five children, had lost a baby daughter, had been an atheist (on two separate occsions), and is ever ready to question aspects of her Mormon faith. She had a degree in philosophy, and when her husband assures her "Death doesn't mean the end of things. It just means a change from one side of the veil to the other," she replies, "Easier to say than to believe." She has never had many female friends because "I had grown up with three brothers, and learned to talk as bluntly as they did. That didn't seem to endear me to other women. But it was also true that my personality was prickly, and that I tended to offend people easily." As a friend told her, "you are honest. Brutally, unflinchingly honest. You force people to face their own failures and weaknesses, and that can be painful." She comes to realise that "Maybe I was just nosy at heart, and had nothing else to do with my time but muck around in other people's business." And she admits she had been "stupid. Untrained, blundering, and ignorant." But she remains firmly determined to do all she can to help other people, and is an attractive and real character. Mette (rhymes with Betty) Ivie Harrison grew up in a devout Mormon family, and graduated from Brigham Young University, with a BA and MA in German Literature. She went on to receive a PhD from Princeton University in Germanic Languages and Literatures. She also became a nationally ranked triathlete. She was the author of eight young adult books when she published her first adult novel, The Bishop's Wife (reviewed below). She writes a regular blog about faith and Mormonism for the Huffington Post, and lives in Utah with her husband and five children. She is an active member of the Mormon church, although she lost her faith for five years after the death of her daughter at birth in 2005. She explains that she wrote The Bishop's Wife " trying to conceive of a Mormon woman whom I might one day be, thoughtful, skeptical, critical, and incisive. I wanted to be able to reject the parts of Mormonism that seemed horrible to me, but to keep the parts I loved. I wanted to be a Mormon, but not the way I had been before, and not according to some outline that someone else had drawn." 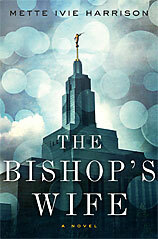 The Bishop's Wife tells how Linda Wallheim, married to a Mormon bishop, is increasingly troubled by her church's structure and secrecy, especially as a disturbing situation takes shape in her ward. One cold winter night, a young wife and mother named Carrie Helm disappears, leaving behind everything she owns. Carrie's husband, Jared, claims his wife has always been unstable and that she has abandoned the family, but Linda doesn't trust him. As Linda snoops into the Helm family's circumstances, she disagrees with her husband and becomes convinced that Jared has murdered his wife and painted himself as a wronged husband. Linda's husband urges her not to get involved in the unfolding family saga. But Linda has become obsessed with Carrie's fate, and with the well-being of Kelly, her vulnerable young daughter, who keeps on reminding Linda of the daughter she had lost. Kelly's own mother had mysteriously disappeared years ago, and Linda becomes convinced that her body might be buried nearby. She cannot let the matter rest until she finds out the truth. The great strength of the book lies in its description of Mormon life and beliefs, especially as Linda seems to question many of them, including male dominance. It is interesting too to read the rules on dating: "No dating at all before 16, and no steady dating until after a mission". Then there were strict rules "on where you could touch a girl, how long you could look at her, and how long you could kiss", with all this preferably followed by a temple wedding that meant the couple would be "sealed for time and all eternity." A church wedding on the other hand, would be for "time only`', and "won't be binding in the afterlife", although "you can have the sealing done after death". Polygamy was no longer acceptable but "a man who'd been a widower could be sealed eternally to two wives, or three or four, or however many you legally married during his lifetime." Widowed women, on the other hand were not allowed to marry again. The church also taught that "everyone who was in the celestial kingdom had to be in a marriage - marriage was the highest law of the gospel." One of the characters in the story "actually thinks that the lost tribes of Israel are frozen under the ice at the North Pole." The same character called "homosexuality and universal healthcare 'signs of the end times'." Linda comments, "If we kicked people out of the Mormon church for believing crazy things like that. We would lose half the people on the rolls." Joseph Smith (the founder of Mormonism who had 40+ wives including a girl of 14) "had given a famous funeral speech for a young child, claiming that children who died before the age of eight were automatically taken into the celestial kingdom and that mothers would there be allowed the privilege of raising their children to adulthood if they miss the chance in this life." But Linda "didn't like the idea that a child was waiting all those years for me to die before she was allowed to grow up." Mormons will not only avoid all alcohol but "drink neither coffee nor tea .... and I know plenty of Mormons who think it wrong to drink hot chocolate, or herbal tea, or decaffeinated coffee. Or anything that could be mistaken for tea at a casual glance. Or anything coffee-flavored. Or rum-flavored. Or even vanilla extract." Human relationships are well described ( there is a moving description of the approaching death of an old man and of Linda's relationship with her doubting son Kenneth), as is interaction in the close-knit, friendly Mormon community, with its ever active Relief Society hurrying to help any member in need. However, the story unfolds too slowly and sometimes struggles to hold the interest, and it all leads up to too unlikely a denouement in which Linda manages to find her way into the killer's house despite the presence of a SWAT team outside supposedly besieging it, in an effort to talk a mad Mormon into releasing his hostages. The author freely admits that she borrowed the basic idea for the story from an unsolved real life Mormon disappearance, and says she had no idea who the killer was when she began writing it. But the intriguing Mormon background, coupled with the author's slightly critical attitude towards it, still make it worth reading. His Right Hand describes how, a few weeks after the events described above, the Mormon community in Draper, Utah, is thrown into upheaval when Carl Ashby, the ward's second counsellor - one of the Bishop's right-hand men - is found choked to death on church property. He had been a TBM (True Blood Mormon), a pillar of the community and a loving husband and father of two adopted children, so who would want him killed? This is a much stronger story than in the previous book. It gets off to an arresting start, and there's plenty of human interest, as when we hear about Linda's first marriage some 20 years before that had ended in divorce after 18 months. This had led to "years of living as an atheist". The author makes us care about her characters and family inter-relationships (as when one of her five sons takes her completely by surprise by declaring himself to be gay, and she describes how her husband reacts, and how, later on, she has to face up to the fact that the last of her sons is leaving home). Linda loves her husband, but even here problems can arise: "Being in an eternal family was supposed to bring more joy to everyday chores, but sometimes just added more stress." As before, the author can take a critical look at Mormon behaviour: Carl, for example, had driven a brand-new silver Lexus, and, as Bishop Kurt pointed out to Linda, "That car could have paid for ten missionaries. Or a whole lot of food in the shelter. We talk so much about modesty in terms of clothing in the church, less about modesty when it comes to giant houses, cars, or television sets." Linda never glamorises her role: Kurt "was already being crushed by the Bishop's responsibilities. He and I both." Confronted with disaster, she knew that "everything was not going to be all right," and admitted that she "couldn't feel any connection to God at the moment." Throughout, she manages to keep her feet on the ground, though there is just one occasion wen she thinks she hears the dead Carl asking her for help. But then "Many Mormons feel they have dreams or other visitations by their own dead ancestors, asking for temple work like baptisms for the dead to be done." Linda explains that, "I believed in God because I wanted to, not because He had proven Himself to me, not because it was logical, not because it was right. I needed God, and I needed Him to make mistakes, like I did." She had made a commitment to Mormonism although "it wasn't the only church I thought had truth in it. I wasn't even sure it had the most truth. But it was my truth. It was the religion I had been brought up in, the religion whose rituals were most comforting to me. When I went back to God, Mormonism was the religion I went back to." it is only at the end that the sense of reality lessens, and there are melodramatic goings-on with a stabbing and a desperate car chase. Action sequences like these are not the author's strongest point and they lack the human interest of earlier episodes. She is much better at describing more personal events, as when she comments, "Being a mother is a big job with a lot of power. God is the craziest of all parents. He gives us enormous power, then steps back and watches what we do with it. It is up to us to prove that we have done something good, and on a very deep level, I believe that the most important thing I ever do with my life is to be a mother." And this, after all, is at the heart of Mormon teaching. 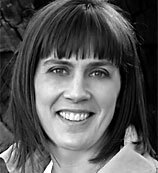 The author has her own informative website where she discusses her Mormon beliefs in detail. There is even a section on "How to Manage Mormon Missionaries". There is also an interesting interview with her on the Utah Writers site. Would anyone who is not a Mormon recognise this as the Mormon temple in Draper, Utah?